Information Technology Services wrapped up National Cyber Security Awareness Month on Friday, October 30, in the Pit with food, fun and factoids about online safety. Gummi fish galore and 72 bags of goldfish crackers do count as food, right? Tim Cline, ITS Information Security Specialist, and other volunteers enticed students hanging out in the Pit to test their knowledge about cyber security. 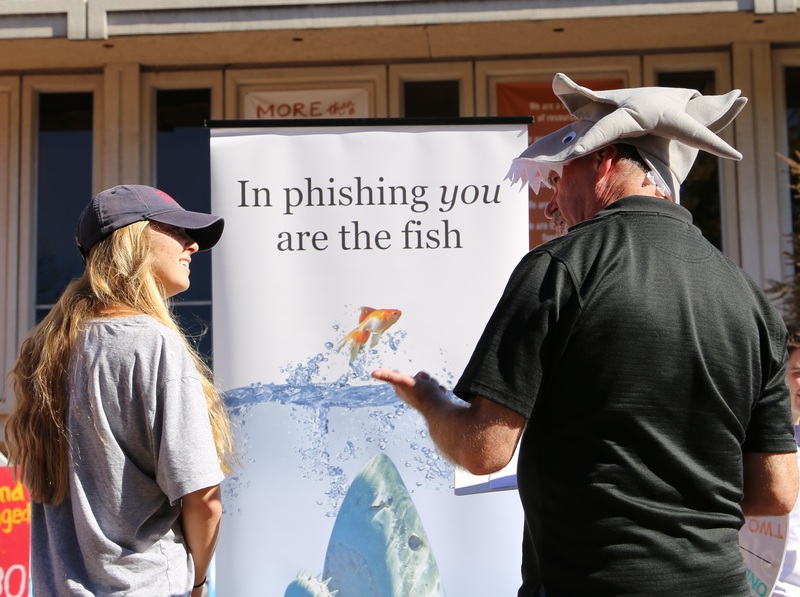 For playing the games and answering security questions posed by the shark hat-wearing Cline, students earned backpack buttons, countless refrigerator magnets, Information Security Office Halloween-themed swag and lots of gummi fish and goldfish crackers. Some 30 players also won the most-coveted prizes—gift certificates to the Daily Grind. Cline also added 30 new followers to the ITS Twitter feed, @UNCTarHeelTech. All in less than four hours.